This card cannot be Normal Summoned or Set. 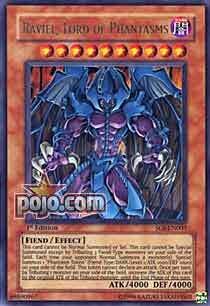 This card cannot be Special Summoned except by Tributing 3 Fiend-Type monsters on your side of the field. Each time your opponent Normal Summons a monster(s). Special Summon 1 "Phantasm Token" (Fiend-Type/DARK/Level 1/ATK 1000/DEF/1000) on your side of the field. this token cannot declare an attack. Once per turn, by Tributing 1 monster on your side of the field, increase the ATK of this card by the original ATK of the Tributed monster, until the End Phase of this turn. Out of the 3 Beasts, we have the one that might actually see some play! For Raviel, you have to give up 3 Fiends on the field, This one can actually be done as there are a lot of good Fiends that can provide field presence (the best being Giant Germ). It's still hand disadvantage to play this guy, but it's actually possible as opposed to the other 2. You gain a 1000/1000 non-attacking (but Tributable) token every time the opponent Special Summons. In addition, Raviel can tribute something (most likely the Token, but possibly an opponent's stolen monster) for an ATK boost until the end of the turn. The best part isn't Raviel though. Obviously, Raviel won't be staying on the field long with all the 1/1 removal. But it doesn't have to -- Necrofear can make an opponent regret their 1/1 removal. The 3 fiends you tributed for Raviel can easily be RFG'd for our more playable big beater. Even better, a double Smashing Ground doesn't finish you as Necrofear would just attach to and steal one of YOUR monsters if you have one down. This means that you either lost a monster or had to not have one (or have one F/D so it can't be Equipped -- does that work?). And with Dark Hole's impending ban (unless April Tewart's Day changes things) you don't have to worry about the worst possible drop that would screw over all your effort. Don't get me wrong, you're still better selling this than playing it, but no one would fault you for making a fun deck around this guy. My CotDs for earlier in the week should be posted by now. Stats : The final card this week is another nomi, so once again the Level is mostly meaningless. For the record, Raviel, Lord of Phantasms is Level 10. He is a Dark/Fiend. The Dark Attribute has some solid support but Fiend support is less hit and more miss. At least we have a fantastic 4000 ATK and DEF to show that this is indeed a brute of a Monster. Effect(s) : In order to Summon this Monster, you must Tribute three Fiend Monsters. Thankfully, they don’t have to be face-up and while it will take more time to set up than the requirements of its siblings… we have quite a few nice ways of getting Fiends into play without burning your hand. Okay, not that many, but some. Raviel generates a “Phantasm Token” each time your opponent Normal Summons a Monster. The token can’t attack and only has 1000 ATK/DEF points, so it’s main use would be getting a second Raviel into play (not high on the priorities list) or being used for Raviel’s third effect. Raviel can Tribute one of your Monsters in play once per turn to increase its own ATK by the Tributed Monster’s original ATK until the end of the turn. So if you can keep your Phantasm Token’s safe, Raviel becomes a 5000 ATK Monster. Combinations : Using some handy cards like Goblin Elite Attack Force (beatstick, offensive wall), Mystic Tomato (capable of fetching small Dark Monsters, which includes several useful Fiends), and Giant Germ (probably good for 500 points of burn damage and two of the needed bits of Tribute Fodder). Goblin Elite Attack Force and Giant Orc have another benefit: if your opponent doesn’t destroy them before your next turn, you can use them for fast 2000+ boost to Raviel. Of course, you already knew that. The problem is that Raviel is as vulnerable as the other “Sacred Beasts”. So you’ll probably have to include several negating cards if you want a chance at keeping it in play a while or you have to try to play it… yes, like a OTK. Though in this case, it wouldn’t be as good a OTK deck, since it’s slower to get out than the other two and is harder to get the needed damage: Hamon has that built in burn effect, so it can afford to run over another Monster, where as Raviel needs a clear field to do his thing. Uria can just get huge enough to eat almost anything and still score a OTK. A quick note, there is a “support” card for Raviel, in that should make getting this big guy into play much easier – Phantasmal Martyrs – as it provides three Fiend Type tokens. Unfortunately, it only works when you have one of the other two “Sacred Beasts” cards in play, requires you have two or more cards in hand, and that you then discard your hand… meaning you have to have a Night Assailant and one other card in hand, another Flip Effect in the Graveyard, Raviel in the Graveyard, and a set Monster Reincarnation if you want to actually gain anything. Yes, that is pretty lame. I don’t know why they even made it: I suppose it makes it possible to run a horrid deck that isn’t more than 40 cards that can feasibly get all three of the Sacred Beasts into play. Traditional : 1/5 – A rating for it in its own deck. Simply put, no. If you are lucky, you could summon it once in a while and maybe, maybe score a hit on your opponent. Advanced : 2/5 – Even in his own deck, he’s just a big beatstick that needs protecting. He’s not as good for a OTK as the others. Normally I wouldn’t want a OTK deck to work, but since all three “Sacred Beasts” are so hard to use and it’s via battle… yeah, I can live with it. Raviel itself suffers because it will take more time/effort to Summon than its siblings even though it technically would have a more stable deck. Dark Paladin We close the week with the best and most playable Sacred Beast, in my own humble opinion. That of course is Raviel, Lord of Phantasms. Instead of sending Magic or Trap cards to your graveyard, you just have to tribute three Fiend monsters from your field, which also could be difficult, but then seems much easier compared to the alternatives. You get a 4000 atk and 4000 def monster to play with then. Plus, Raviel has a self boosting ability for each turn to increase his attack by 1000 x the monster(s) you tribute. Furthermore, if your opponent Special Summons a monster, you get a token you can hopefully tribute next turn. Art: 5/5 All 3 Sacred Beasts have impressive art. The worst of the Lords. I'll give you that tributing 3 s/ts to summon a ridiculously massive monster is good. Chucking 3 Type-Specific monsters is a tad too far in my opinion. Also, his effect is generally moot. If you can't win with 4000 ATK, I think something is wrong. The generation of 1000/1000 defensive tokens is also a pain, as it will mostly just get in the way of playing something genuinely useful. At least you can blow them up as often as required for extra ATK should you happen to need it. Wrapping up the weak we take a look today at Raviel, the French demon. IMO he is the worst of the demons. His summoning requirements are the hardest of them all: three fiends. Now they did make a support card to give you tokens to make getting him out easier, but lets be serious, you need to get out one of the others (-3) and then play the spell (-1) then discard your hand which has to be at least 2 (-2+) to get three tokens that you will just tribute anyways. But to make that card worse, you won’t have Raviel in the hand after using it, meaning you have to keep them alive UNTIL you draw Raviel, which won’t happen. The best way to get him out would simply be DNA Surgery and some tokens and/or the Frog. Regardless it’s still hard and not worth is no matter how you look at it. Now let’s look at his effects and stats. For more work you essentially get Hamon, now of course they are different, but the burn damage of Hamon is made up by the addition attack power of Raviel once he’s sacked something. But this requires you to get piercing damage, where Hamon doesn’t. Overall for battle he is more situational but most likely you’ll see the same amount of average damage for both. The final card for this week, and the last of the 3 new gods. Of the 3 f these gods, this is most easily played, requiring the difficult yet simple offering of 3 fiend type monsters in order to be special summoned. This is why he is splash able in any fiend or Dark World deck , and has extreme synergy with cards like Giant germ. Of course, sometimes tributing 3 fiends wont be worthwhile in situations. Raviel’s attack is again, like Hamon’s unsurpassable. The same statistically as Obelisk the tormentor, fitting as this is its GX’ counterpart. Much like Obelisk, you can then increase his attack by sacrificing one monster on your side of the field, thereby increasing Raviel’s attack by the same amount as the tributed creature until the end of the turn. A powerful effect, and an instant win when combined with Hamon (however unlikely that may be). Raviel also possesses a token ability, allowing for a 1000/1000 token to be special summoned to your field whenever an opponent summons a monster. Not that bad really, at least allowing for a tribute summon, a defense, or at the very least a momentary boost for Raviel himself. Of course, Raviel bears the standard weakness to Monster removal, as well as is difficult to summon. Advanced : 3.5/5 - Not bad, hard to do, but not bad. Art ; 5/5 - Very nice indeed, still not as good as Obelisk.